On a sunny but cold early spring morning, the men and women of Kineso gathered at YLE’s premises in Mediapolis, Tampere. We were all excited and perhaps acting a little giddy, since it was a huge day for us. We were out to spend the whole day capturing new animations for 3DFysio, our mobile app aimed for physical therapists and their clients, currently under development. Mikko Karsisto is making sure the markers on Pirpa Takki’s back are properly attached. Now, many apps have simple, drawn 2D pictures of the exercise or little handcrafted animations to accompany the written description of the exercise. Our way of doing things is fundamentally different: we chose to produce reusable, high quality animations with motion capture technology. 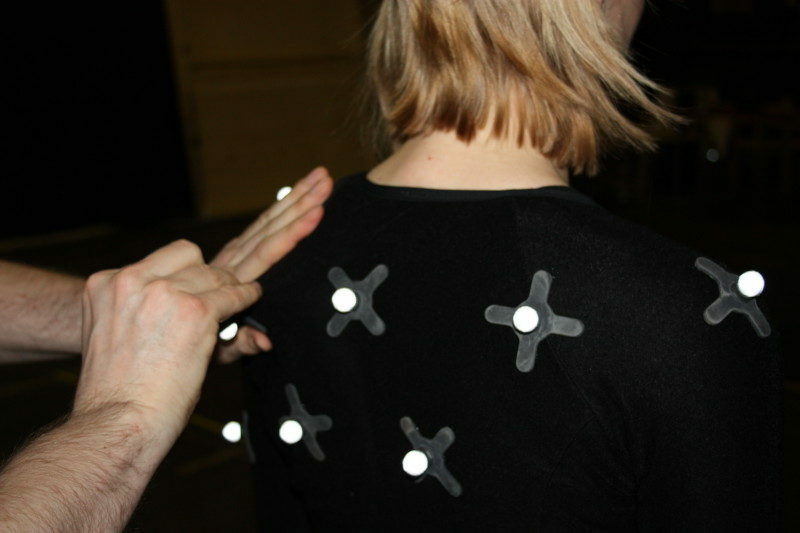 In motion capture, the actor or actress wears a suit with reflective markers all around the body, while an array of specialized infrared cameras record the positions of the markers from different angles and finally translate the data into a generic animation file, which can be played with various different 3D characters. This kind of technology is usually seen only in AAA video games and CGI animated characters in movies. So our goal at Kineso is to develop the best possible virtual PT exercise assistant. As it happens, one unused TV studio building at Mediapolis has been recently transformed into a state-of-the-art motion capture studio with a grand total of thirty-six Optitrack Prime cameras spread in a carefully constructed formation. Kineso’s PT consultant Piia Tarnanen had prepared us a selection of over 70 different exercises we were about to capture with this fancy setup. We also brought two different actresses to perform the moves itself, PT student Pirpa Takki and recent PT graduate Mira Kasanen. The master of mo-cap cameras, Mikko Karsisto from Apex Games, was handling the recording equipment (pressing the red button!) and instructing our actresses about all technical aspects of motion capture. Meanwhile Piia Tarnanen was supervising each movement’s accuracy from physical therapists’ point-of-view. After all, even the best camera equipment can produce sub-par results if the actor doesn’t perform the movement like a textbook example! “I could totally see this replacing the old solutions! It was also fun to walk around with the suit on”, says Mira Kasanen. Our task at hand couldn’t possibly be described as easy, but it sure was fun to watch and be part of! As it turned out, the most challenging animations to capture were the ones where the patient is supposed to lie on the floor, as it covers the view of most of the markers located around the actor’s back. The camera setup cannot make educated guesses, it has to see the markers from different angles to be able to translate the motion correctly into an animation file. We tried to come up with different contraptions to lift up the actresses a bit: a metal trolley, couple of chairs, and other random stuff we found around the studio. The idea was to put the actress lying down on a surface made of thin metal bars just enough above ground to leave the markers visible. All the equipment is of course rendered invisible in the final animation, so the setup is open for some seriously imaginative solutions, if the results look good enough. Mira Kasanen concentrating for the next movement in our extremely comfortable, improvised bed. Our animation needs in general were very different than those of game studios and other companies that typically require motion capture services. “Many of our customers want splashy, powerful, dynamic movements. Kineso’s needs were more about the accuracy and subtlety of small movements. This was also the very first time we tried capturing upward from the ground”, says Mikko Karsisto from Apex Games. Kineso’s field trip at Mediapolis proved successful. We recorded almost all the animations we wanted and got a metric ton of valuable experience for the next round! Jaakko Rohunen is Co-founder and software developer at Kineso Oy. He has a BBA from TAMK.